Make yourself a bowl of pasta in under 30 minutes (and for only 400 calories or 13 WW points)! 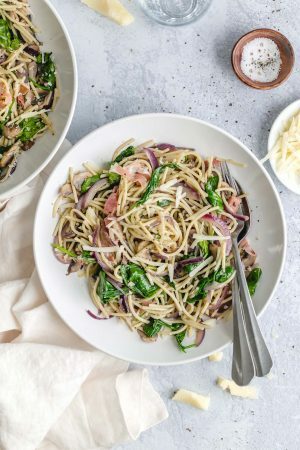 You don’t need a sauce with all of the flavor from aromatic garlic, fresh basil, salty prosciutto, and rich Parmesan cheese. Boil the pasta in generously salted water according to package instructions. Drain and set aside. Meanwhile, in a large nonstick skillet, heat the olive oil and butter over medium high heat. When the butter is melted, add the garlic, mushrooms, and onion, and cook, stirring occasionally, until the onions are soft and the mushrooms are soft and lightly browned, about 5 minutes. Add the salt, pepper, and prosciutto and cook, stirring constantly, for 1 minute. Add the spinach and let it sit on top of the hot skillet for 30 seconds. Remove the skillet from heat and add the cooked spaghetti, tossing to mix everything (the spinach will wilt as you mix). Add the fresh basil and the Parmesan, toss again, and serve immediately (with extra Parmesan, if desired).